Zucchini. I’ve never been a huge fan… until now. Zucchini is all of a sudden one of my favorite veggies as the star ingredient in one of the best pizza crusts I’ve ever had. 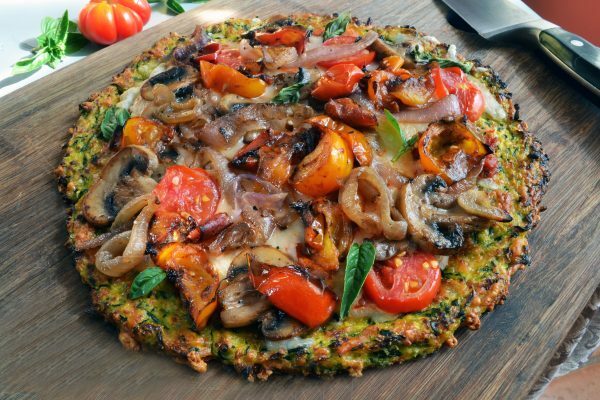 Move over, cauliflower pizza crust. I think this one tops it by a mile! You will love the way this pizza crust cooks up. The big secret is to make sure you squeeze, squeeze, squeeze out the water from the shredded zucchini. Once you make the crust, load it up with any of your favorite pizza toppings. Does dad love pizza and beer? Here’s the perfect Father’s Day gift from your kitchen! Preheat the oven to 475ºF. In a large bowl, toss the zucchini with 1 tsp coarse salt and set aside for 15 minutes. Squeeze the excess moisture out of the zucchini by wrapping it up in a clean tea towel or cheese cloth and wring it out, discarding the water. Place the shredded zucchini back into a large bowl. Add fresh grated Parmesan (or Parmesan Romano mix), flour, yellow corn meal, garlic, shallot, eggs, 1 tsp salt, and pepper. With a large spoon, mix until well incorporated. Place parchment paper on two round 12" pizza pans (cutting paper to fit pan) and spray with cooking oil. Using your fingers, spread the zucchini crust mixture on each pan to form circles about 8" in diameter and about ½" thick. Bake for approximately 15 minutes, or until the crust starts to brown. Remove from the oven, add toppings, and return to the oven for 7-8 minutes, or until cheese has melted and toppings are cooked. Spoon the pizza sauce over the cooked zucchini crust. Sprinkle mozzarella over the top. In a skillet, heat the butter and add mushrooms, cooking on high heat until browned. When done, spread over pizza. In the same skillet, add onions and cook until caramelized (add a little more butter or olive oil, if necessary). When done, distribute over pizza. In the same skillet, add tomatoes and brown sugar. Cook for about 5 minutes on medium high heat to soften. When done, spread over the pizza. Bake for about 8 minutes, or until cheese has melted. Remove from the oven. Top with prosciutto and fresh cut basil.